In this week’s edition of Chatting with… we sat down with the two time Boy’s Gatorade Runner of the Year Zach Herriott. 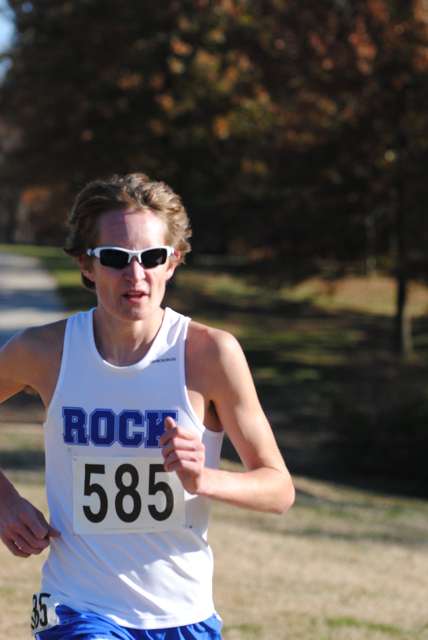 The All-American, coming off a State Championship his junior year, had a historic senior season for Rockhurst High School, winning most of his races, setting numerous course records, and helping the Rockhurst Cross Country Team finish its best ever at State with a second place finish. He continued this success into the latter stages of the season, placing 4th at the Nike Cross Nationals Midwest Regionals, which was good enough to qualify for the NXN meet (Nationals). At Nationals, he finished 9th place out of 200 in a race filled with some of the best runners in the country. kcyoungguns: Thanks for taking the time Zach. Let’s start with the beginning of this season. After winning state last year, how did you deal with the expectations heading into this season as the State Champion? Zach Herriott: Obviously, there is a lot of pressure being a defending state champion. But most of that pressure came from myself. After winning state, I set very high expectations for myself. But my downfall was that I couldn’t live with anything less than first. Of course I want to win every race I’m in. But the reality is you can’t win every single race, and being able to accept that was a big part in my maturation as a runner. KC: I think it’s hard for someone who isn’t familiar with cross country to understand how cross country runners motivate themselves to run every day (sometimes even twice a day). How did you motivate yourself to become better when you already were the best in the state? ZH: If anything, state motivated me to work harder. After state, there was a huge target on my back. I knew that everyone was gunning for me. Because of that, I had to work even harder than I was before, because I knew all my competition was doing the same. And I also realized that in the huge world of high school running, there are hundreds of state champions because there are multiple classes per state. So instead of being a state champion, I had to take it to the next level and work to be an All-American. KC: It seems like the Rockhurst Cross Country team was a really close knit group of guys, almost like a family. What do you think attributed to this closeness as a team? ZH: Our team was so close because we all wanted to be great. We all wanted to win state. To do that, everyone understood we needed to forge a trust between each other. That trust includes things like always thinking of your teammates before yourself and making sure that everyone is always making the best decisions. As teenagers there are obviously a lot of opportunities to do stupid things that could be detrimental to our training. But we made a commitment and promise to each other that we would stay out of situations like that, and for the most part we were successful. KC: Throughout the season, you won most of your races and set numerous course records, what are you thinking about before a race, and can you tell before a race if it will be a good or bad one? KC: I’m sure you’ve explained this countless times, but I must ask. You were in the lead at State this year with 2 miles left. Can you describe what happened after those 2 miles? ZH: I felt the shutdown coming. Even after one mile, I knew I was going downhill. But at the two mile mark, my whole body basically locked up. My arms were incredibly weak and my legs felt like concrete. It was the worst feeling in the world because I was pretty conscious of what was going on, but I couldn’t do anything about it. People just kept flying past me and I couldn’t pick up my legs at all to stay with them. At that point, I knew I just had to finish so that I wouldn’t let down my teammates. KC:Despite the tough race, the Rockhurst Cross Country team placed 2nd at state. What did that mean to you? ZH: Getting second as a team was better than winning individually. It would’ve been even better if I had done better individually of course. But once we found out we got second, we huddled together and were just so happy. I can’t even explain the feeling in words. We just looked at each other and knew that we did something very significant. We left our mark on the Rockhurst cross country program, and no one will ever forget our class, because we started a tradition of excellence. That is something really special to all of us that we’ll treasure forever. KC: After the State meet, you bounced back with a 4th place finish at the Nike Cross Nationals Midwest Regional? How were you able to look past the previous meet and succeed at the Regionals Meet? ZH: To be honest, I think the failure at state led to my success at Nike Regionals. I realized that I was way too tense at state. So at Regionals, I simply relaxed. Instead of focusing about the race too much, I just focused on enjoying the time with my team. Before the race when we huddle up to pray and wish each other luck, it’s normally really serious. But at Regionals, we were all joking and laughing the whole time. That took my mind off the race and forced me to focus on simply enjoying the moment because I knew that might have been my last high school cross country race if I didn’t get top five. But I raced very patiently and before I knew it I found myself in second place with 400 meters left. I fell back to fourth but I didn’t care. I qualified and that’s all that mattered. KC: After Regionals, you qualified for the NXN meet (Nationals) and placed 9th. What was it like running in that kind of big time setting? ZH: Nike Cross Nationals was one of the most memorable experiences of my high school career. Honestly, I was a bit intimidated by the number of good runners there. But I got to know a lot of them, and realized most of them are just like me. That gave me a lot of confidence going into the race. I used the patience that I learned at Nike Regionals to my advantage at Nationals. The race went out really fast but I stayed at the very back of the race and slowly worked my way up. With about one mile left, I looked around and realized that all of the top runners were around me. That was when it finally hit me that I was having the race of my life. So I just stayed up with them until the end. Finishing and being able to say that I got 9th out of 200 of the nation’s best runners and can now be called an All-American was an amazing feeling and I’m proud of it because I’ve worked incredibly hard and have had to sacrifice a lot to get to this level. KC: Looking toward the future, what colleges are you considering, and is there any one college you’re leaning toward? ZH: The college process has been very hectic but it is definitely almost done. I visited Georgetown and Notre Dame in the fall, and have visited Oklahoma and Wisconsin this winter. All are great programs and schools, so the decision will be very difficult. I’m not leaning towards any one in particular at this point because I just finished my visits, so I’m going to sit down and evaluate them all and hopefully have a decision in a couple weeks. KC: You were just recently named the Boy’s Gatorade Runner of the Year for the second year in a row. What does it mean for you to win that award for a second time in a row? ZH: Winning the Gatorade award was very important to me because it only recognizes all-around student athletes. Simply being a good runner is not enough to win the award, as the award’s history shows. Recipients must be good students and contributing citizens in their communities. Because of all the factors that are considered when deciding a winner, I am especially proud of this award and to be a two time recipient is incredible. I am very grateful to everyone that’s supported me in my running, especially my parents and Coach Dierks. Without them, I wouldn’t be half the person I am today and I am proud to say they have been huge influences in my life. We want to thank Zach again for taking the time to complete this interview. Also, if by chance you missed our previous Chatting with… segment, check out our inteview with Blue Springs South do-it-all football standout Connor Harris. And remember, if you know someone who should be recognized for the week in our Chatting with… segment, email Blase Capelli at bcapelli10@gmail.com or Spencer Montgomery at smontgomery2012@gmail.com. This entry was posted in Home, The Peoples Voice and tagged Chatting with, cross country, Rockhurst high school, running, Zach Herriott.